The first SSD to challenge hard drives head-on is here. As the world’s first SSD to market with ground-breaking quad-level cell (QLC) NAND technology, the Micron 5210 ION delivers fast capacity for less. 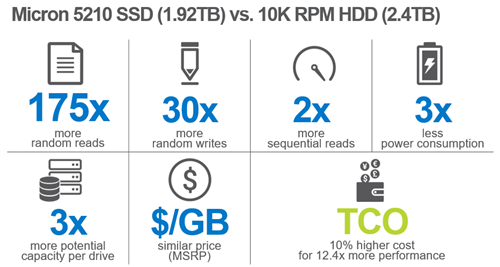 Designed for the workloads of today and tomorrow – real-time analytics, big data, media streaming, block/object, SQL/NoSQL, and the data lakes that feed AI and machine learning – the Micron 5210 SSD accelerates quick analysis into action. Freed from the confines of hard drive technology, storage architectures can now move to speed and scale, enabling greater infrastructure flexibility and data intelligence. Endless insight. Deep learning. Speed reading. Before the age of AI, data center read-to-write ratios1 were typically 4:1. Now it’s more like 5,000:1 and solutions to problems are increasingly found in the patterns data makes. Whether you’re querying a 10TB SQL database, streaming content and adjusting to traffic, or analyzing daily transactions to tune your business model, real-time speed reading is key. Spin Struggles. You Don't Have to. Cull oceans of data for answers while writing lots of data.3 Adjust endurance and write performance with our signature Flex Capacity feature. Capacities starting in terabytes, not gigabytes. QLC technology allows you to store 33 percent more bits per cell and get more fast capacity for less. Disable browsing on one or more devices with an optional announcement message. Get everything you expect: AES 256-bit encryption, TCG Enterprise options, end-to-end data path protection, power loss protection, and 5-year warranty. Learn about QLC SSD and HDD wear limits and endurance ratings and how your application environment can affect drive replacement decisions. Get flash benefits for more of your read-intensive workloads with Micron quad-level cell NAND flash technology. The first SSD to challenge hard drives is here. 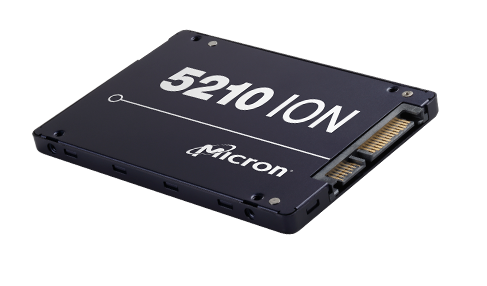 The Micron® 5210 ION is the world’s first SSD to market with ground-breaking quad-level cell (QLC) NAND technology. Learn how Quad-Level Cell Storage reclaims high-value rack space in overcrowded data centers and swelling data lakes. Get fast capacity for less with the world’s first quad-level cell (QLC) SSD, the Micron®5210 ION enterprise SATA SSD. Created for the data age. Secure a quote from our sales team and make sure to ask about our volume discount.